Good news, as Steven Gerrard has signed a new deal that should keep him at Liverpool until he retires and that includes an ambassadorial when with the team once he finishes playing. 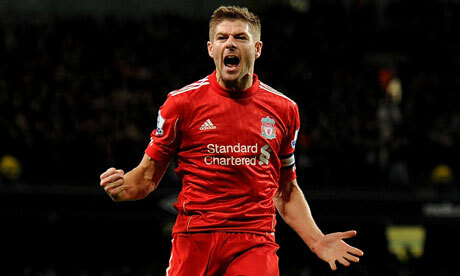 Manager Kenny Dalglish highlighted Gerrard’s loyalty to his hometown club. Dalglish’s comments remind us of what we wrote when Gerrard signed his last deal with Liverpool. Morris Claiborne, LSU’s All-American cornerback, announced on Thursday that he is entering the NFL draft. Claiborne, the third-rated player on ESPN Scouts Inc.’s draft board, led the Tigers with six interceptions this season and returned one for a touchdown. The winner of the Jim Thorpe Award as the nation’s top defensive back also was LSU’s top kickoff returner, averaging 25 yards per return, with one touchdown that went 99 yards. Wonder what Ben Roethlisberger, Joe Flacco and Andy Dalton would think about lining up twice a year against a pair of SEC cornerbacks in Orange and Brown? The Indians are reportedly interested in free agent first baseman Carlos Pena, with general manager Chris Antonetti waiting to see if the Dolans will open their wallets. While Pena is a name that fans will recognize, that doesn’t mean he will solve all the Tribe’s problems at first base. “Completely helpless against left-handers now”…oof, we already have a couple of those. Unfortunately, what the scout sees bears out in the numbers as Pena posted a .594 OPS vs. LHP in the NL last year, which comes on the heels of a .675 OPS vs. LHP campaign in 2010 for the Rays. In the last 3 years, Pena has a .704 OPS vs. LHP, a number that has trended down since the 2009 campaign. As a quick aside, Hafner’s OPS vs. LHP over that same timeframe (the last 3 years) is .680, so Hafner has actually been less effective than Pena vs. LHP since the beginning of the 2009 season…and since there would only be one Carlos Santana to go around, you’d still be looking for a RH platoon partner for Pena (or Hafner) if a guy like Pena is signed, warts and all. Read the rest of Paul’s analysis of the situation here. Hopefully someone can forward the link to the Dolans to help them with their decision. Finally, it was one year ago today that the Browns hired Pat Shurmur as head coach. Here’s what we had to say about the hiring. Looking back on what we wrote when Shurmur was hired, we pretty much nailed it.